This is a Invitation. It was designed by Edward Fella. It is dated 1992 and we acquired it in 1995. Its medium is offset lithograph on tan paper. It is a part of the Drawings, Prints, and Graphic Design department. This object was donated by Edward Fella and catalogued by Molly Seiler and Molly Seiler. It is credited Gift of Edward Fella. 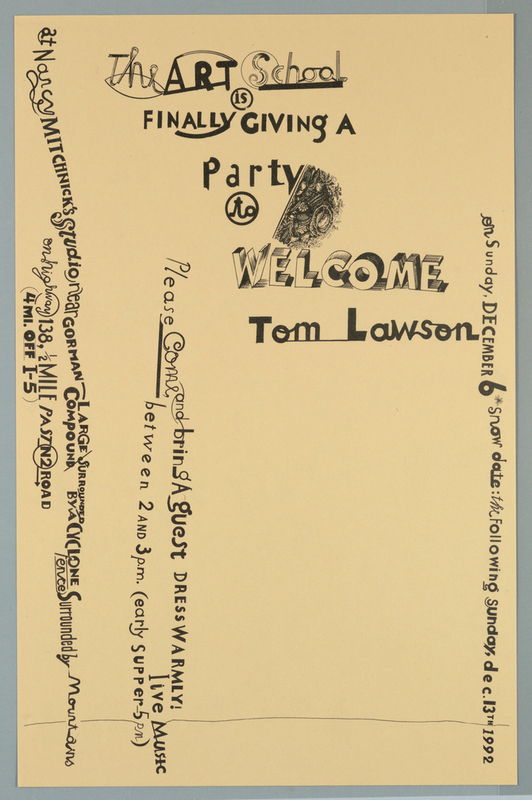 Recto: Imprinted in black across pper half of sheet: The ART School/ is/ FINALLY GIVING A/ Party/ to/ WELCOME/ Tom Lawson; from center to lower edge, running downward, sideways: Please Come and bring A guest DRESS WARMLY!/ live MUSIC/ between 2 AND 3p.m. (early suppers-- 5 pm); across left edge, running downward, sideways: at Nancy Mitchnick's Studio near GORMAN--LARGE/COMPOUND/ SURROUNDED/ BY A CYCLONE/ fence/ Surrounded by Mountains/ on highway 138, 1/2 MILE PASTN2ROAD/ (4MI. OFF I-5); across right edge, running downward, sideways: on Sunday, December 6 snow date: the Following sunday, dec 13TH 1992 Verso: Across lower left quadrant, at various angles in the form of a map, directions, locations (e.g. GORMAN, 138, UP, HERE).